chord forms | The How-To Repository for the Cigar Box Guitar Movement! We’ve just added a great new resource to the knowledgebase: Gitty’s Jamming Guides for 3-string Cigar Box Guitar! 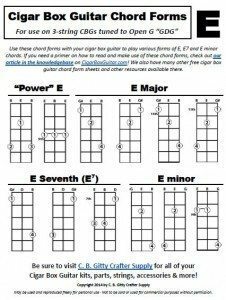 This collection consists of 3 printable sheets that show you all of the chords needed to play most songs written in the keys of C, G and D – majors, minors and sevenths. These were designed with jam sessions in mind – with these on the table in front of you, you’ll rarely be at a loss for how to strum along with most popular songs! Click the image to the left to go to the knowledgebase page, where you can click to view all 3 printable jamming sheets! 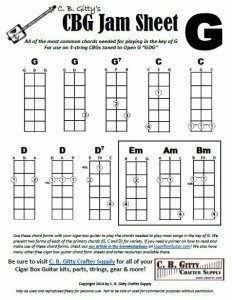 Many more chord form sheets have been added to the knowledgebase here on CigarBoxGuitar.com, completing the initial series for 3-string Open G GDG cigar box guitars. 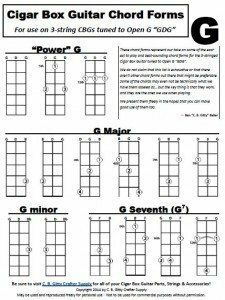 We now have sheets showing all of the most common and useful chord forms (with power chords, major chords, sevenths and minors) for G, A, B-flat, B, C, D, E-flat, E and F! We have also created a guide to reading and interpreting the chord form sheets, to help you become more familiar with the concepts if you are a new player. This is the most comprehensive free resource that has ever been compiled for 3-string cigar box guitars, and it is only going to keep getting bigger and better! We have added a new category to the knowledgebase here on CigarBoxGuitar.com – 3-string CBG chord forms! So far we have added G, C and D chord forms. The rest of the common chord forms (A, Eb, E, B, Bb, F) will be coming in the next few days!